If you are signed up to receive my monthly e-teachings, you hopefully remember that in January, my article dealt with the “other lovers” who rob God of being loved as He should. If we don’t love God as He deserves, something lesser has our hearts. Scripture lists many other lovers who are waiting for a cheap relationship. Among them are “love of the world,” “love of the approval of men,” “love of money” and “love of self.” All amount to idolatry. Heaven’s Family is more than a ministry name. It is a family of lovers that includes you. Foremost, we love God, and because we love Him, we love the Lord Jesus Christ and each other. And our love goes deeper than our skin. It has been placed in our hearts by God, and it’s flowing from us in word and deed by the power of the Holy Spirit. 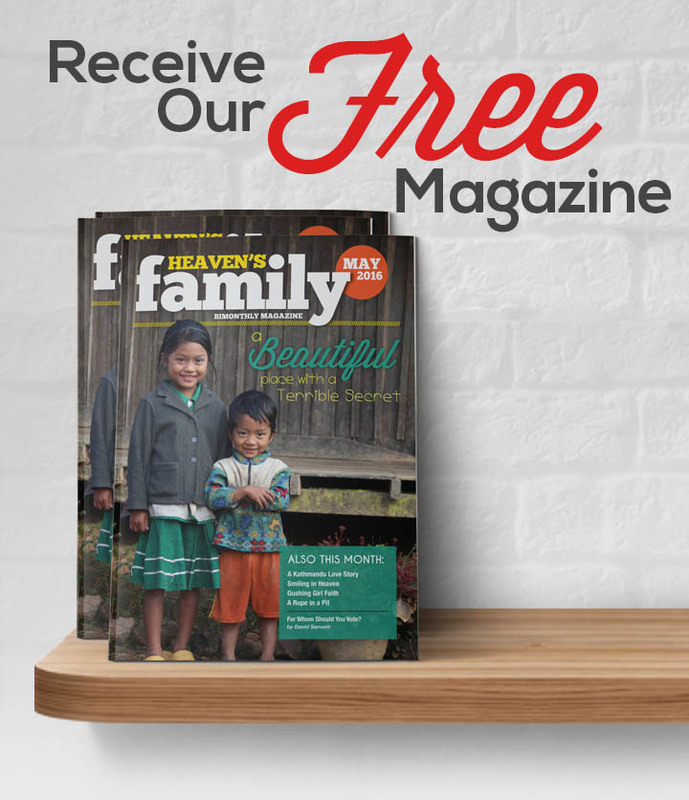 May this issue of our monthly magazine lift you into higher realms of God’s marvelous love! You can sign up for David Servant’s monthly e-teaching by creating and logging in to your account at HeavensFamily.org. Then click on My Account>My E-Mail Subscriptions. Then simply select your communications preferences. Velanganni Ramya (who was raised in an orphanage) and her three children Robin, Kevin and Bevin, with their well-used biosand filter from Heaven’s Family. The narrow, dirt roads of the small Indian village turned into slippery mud in the falling rain. I was determined, however, not to be deterred in my trek. I would soon be among some of the poorest people on planet earth. I had come to inspect several biosand filters that had been placed with families in this village about four months ago. I was accompanied by a man named Stalin, who is our biosand filter project director in Madurai, India, as well as a pastor who has been helping us. Jothi and Justin Soosai of India. Even the not-as-poor appreciate their biosand filters when safe water is unavailable. Every one of the four homes we visited was very humble. But in the corner of one of the rooms in each of these dwellings was a biosand filter supplied by the Heaven’s Family Safe Water Fund. I was quickly able to spot several problems with the filters. The drain tubes were too long, the sand was not at the proper level under the water, and the water flow rate from the filters was very slow, indeed. So I reviewed some instructions with the team that was with me. They would later return to make the corrections. Yet in spite of the problems I discovered, the poor families using the filters simply could not say enough positive things about them! In fact, they argued a bit with me when I told them that we had to make some slight adjustments. They were enjoying such good health from the filtered water that they simply did not want to change anything! One by one, I asked them about their health, and it was unanimous; no one was suffering from sickness as they had before their filters. Velanganni and her sons are in the photo at the beginning of this article. I was moved with compassion as I stepped into their “house.” The walls were plastic tarps. The floor was dirt. And except for the metal roof over their heads, they had little protection from the elements. I simply had to give her a small amount of cash to help her! And she was so thankful for our visit, even wanting to give us some food. As I walked away from the village, I reflected upon what I had just experienced. Even though these families were using poorly-functioning biosand filters, they were getting the safest drinking water they had ever had in their lives. No more sickness! Not one complaint! Then I also remembered how in Africa we had seen less-than-properly-functioning biosand filters also improve the health of their users. So it is conclusive in my experience in both Africa and Asia; the resiliency of the biosand filter is amazing! And so are the people who are using them. The Bigger Picture: So far, gifts to the Safe Water Fund have transformed the health of at least thirty-thousand people in six nations. Poor believers in Congo, India, Kenya, Pakistan, Peru and Rwanda are thanking God for safer water. 100% of all gifts to the Safe Water Fund, administrated by International Director Chuck King, help us purchase and distribute Sawyer water filters, as well as manufacture and distribute biosand water filters. Did you know that there is a way that you can win people to Jesus in another country without ever leaving home? All you have to do is enable an able servant who already lives in another nation. National missionaries already know the local language, customs and culture. They are happy to live on very little. Sometimes it is possible to support over one-hundred national missionaries for the cost of a single Western missionary. As we have been praying to reach out to a particular tribe called Pa Daung (most people have known them as long-neck tribe), we were so privileged to reach them with the Gospel of Christ. On November 11th, we and our students marched to Maung Pin village in Ka Yar State with all the gospel tracts that’s left in our hands. It took us three days to get to the nearest village. First, we took a vehicle, and then an oxen-cart, and the rest distance was done by bare foot. The roads were terribly bad. But it was a joy for all of us to introduce our Lord Jesus Christ and His love to these people who did not have any contact with any outsider for almost a half-century. There were nine families whom we have shared the Gospel of Christ. We took the time as slowly as possible to make them understand the gospel we are preaching, for they have never heard a message and for them God does not exist. It took us more than two weeks to build a good relationship with them. We helped them at noon in their cultivation site and we asked them to help join us in evening services. We will be visiting eight other villages near by in December and in January. The Bigger Picture: There are many able missionaries who are waiting to be enabled. Heaven’s Family can link you, your home fellowship, or your church to an effective national missionary. You can set the dollar amount that you would like to send each month, from $20 to $200. We will forward 100% of what we receive to your national missionary. Perhaps the best part of our National Missionary Support Program is that you will receive regular reports from your national missionary in the field, in imperfect but understandable English. If you are interested in adopting one, drop us an email at [email protected] and we’ll work out the details with you. You’ll share in the reward of your missionary, on earth and in heaven! Another forty minutes of lying in the truck bed seemed unimaginable to Alma. She was in labor with her first child, and she was feeling every bump of the dusty Mexican road. The truck in which she lay had just left their tiny, mountain village. The nearest hospital was forty-five minutes away. Alma and her husband, Angel, had intended to have their firstborn at home with the help of a midwife. Everything had gone smoothly at first, but after ten hours of labor, the midwife realized that the baby was in a breech position, and they were in trouble. Their only “ambulance” was an old work truck that belonged to missionary Jason Fitzpatrick. Jason and his wife, Nicole, had led Angel to the Lord seven years earlier, and had been discipling both Angel and Alma for years. Unfortunately, Angel and Alma’s baby girl arrived in the world before the truck arrived at the hospital. She had no pulse and wasn’t breathing. Her eyes were rolled back in her head, and her umbilical cord was wrapped around her neck several times. She was unresponsive. When the truck finally reached the hospital, the baby was rushed to the pediatric ICU. Surprisingly, doctors were able to revive her. They placed her on a life support machine, but they gave Alma and Angel no hope that their little girl would ever breathe on her own. She had suffered extensive brain damage. After three days, the doctors attempted to wean the baby from life support, but both of her tiny lungs collapsed. She would spend the next six weeks in the ICU, attached to breathing machines and stuck with IV lines. That was ten-and-a-half months ago. Since then, Alma and Angel’s baby girl has faced an uphill battle, but Heaven’s Family has helped every step of the way, paying for ongoing medical bills that her parents could never afford. At six months, the baby weighed only twelve pounds and suffered almost constant convulsions. Doctors were uncertain if she could see or hear. But she was breathing on her own! The Bigger Picture: Because of contributions to Heaven’s Family’s Critical Medical Needs Fund, in recent months we’ve assisted critically-ill members of our spiritual family in Kenya, Mexico, Myanmar, the Dominican Republic and India. Lives have been saved as a result of brain-tumor, intestinal, hernia, and balloon-heart surgeries, all paid for by HF. Thanks so much for being the answer to many fervent prayers. Jean-Pierre Ndayishimiye had two dreams. The first was to make enough money to provide for his fruitful wife and their five beautiful children. The second was to have enough time to feed four flocks. Jean-Pierre and his wife were overseeing four house churches in the capital city of the east African nation of Burundi. Working as a welder in his own workshop, Jean-Pierre earned about 89,000 Burundi Francs each month. That may sound as if it would be plenty to support a family for a month, but it is equivalent to only eighty dollars. Contrary to what many of us living in wealthy nations have been led to think, eighty dollars doesn’t go much further in Africa than it does in the U.S. or Canada. Even if it goes twice as far, imagine a family of seven living on one-hundred and sixty dollars each month. Trying to support his family with so little income, however, was not Jean-Pierre’s only problem. His crude welding machine was substandard. It could only weld aluminum. So Jean-Pierre’s clientele was also quite limited. Worse, Jean-Pierre learned that his third-rate welding machine was about to be outlawed. Although he had innocently purchased it, he discovered that it had been constructed from stolen high-voltage electrical wires. The Burundi government had set an imminent date when it would be illegal for Jean-Pierre to own or operate his welder. He had no money to purchase a legal welding machine. Thankfully, this story has a happy ending. By means of Heaven’s Family’s Micro-Loan Fund, Jean-Pierre received a loan of $450 just before the government deadline that would ban his welder. Now he has a legal machine that will weld many metals besides aluminum. Things are looking up. Jean-Pierre has been faithfully repaying his loan. And he is not only better feeding his family, but he also has more time to feed his four flocks. The Bigger Picture: To date, gifts to the Micro-Loan Fund have capitalized five micro-banks in four developing nations holding an aggregate total of $12,400 in loans. Those funds will provide blessings for poor believers until Jesus returns. Micro-Loan Fund Manager David Growden is praying to end 2010 with $100,000 in micro-bank capitalization in ten nations. Beatrice Nakhumicha does not know how her husband died. He went into hiding in 2002 after committing a crime at work, leaving her to care for their nine children. Four years later his corpse was delivered to her house. Three of Beatrice’s children had to drop out of public school because she could not afford the mandatory school fees. Her two oldest daughters now have children who also depend on her. Beatrice works as a farm laborer during planting and harvesting seasons, making about two dollars a day. Eunice Masinde’s (see photo below) husband infected her with the HIV virus before he died of AIDS in 2002, leaving her with three children, one of whom is mentally challenged. Eunice has not been able to afford school fees for any of her children, so none are getting an education. Even though she struggles with her illness, Eunice knits table cloths to sell, but her earnings do not provide enough for her family’s daily needs. Dorcus Nanjala’s (see photo below) husband was a victim of ethnic cleansing during Kenya’s post-election violence in 2007. He was dragged from their home one night and his body was found on the road the next day. He left her with five children. Two are being raised by Dorcus’ impoverished parents, and Dorcus and her other three children live in a one-room mud house. She washes clothes for those who are better off, but her earnings are meager. Only her oldest daughter can attend school. But there is good news. These three Kenyan widows, along with six others with similar tragic stories, have all responded to the gospel within the last two years. They heard the good news from a Heaven’s Family-sponsored national missionary, and all are now being discipled in house churches that missionary has planted in their common slum. In November of last year, all nine widows joined together to purchase twenty tons of corn by means of a $6,300 grant from Heaven’s Family’s Widows & Abandoned Women Fund. Their purchase was made during the harvest when prices are lowest, and they are now storing the corn until March in order to sell it when prices are generally much higher. Each of the nine widows could earn a profit of as much as $400, a huge windfall by their standards. In May, they will reinvest the original capital by purchasing just-harvested beans, with the intention of storing them four or five months and selling when prices rise. It will then be time to invest once again in corn. Their profits will not only provide food for their forty-six dependent children and grandchildren, but will put many of them back in school. The Bigger Picture: It is not only those who have given to the Widows & Abandoned Women Fund who helped these nine widows. Those who sponsor the national missionary (through our National Missionary Support Program) who led all nine of those widows to Christ have also helped. Those who have given to the Books for Pastors Fund, which imparted that national missionary with a vision to plant house churches, have also helped. Finally, everyone who has given to the General Fund has also played a part, because nothing can be done without someone paying the administrative expenses. Thanks to all! In 2009, poor Christian widows in six nations received grants totaling $24,268 from the Widows & Abandoned Women Fund. Donating Stock to Charity — Is it advantageous to donate stocks to Heaven’s Family? Does it matter if they are winning stocks or losing stocks? David Warnock will assist you in making an informed decision. Read More. How about giving a gift to someone who has nothing in honor of that person who has everything? Heaven’s Family has many funds that help our very poor brothers and sisters around the world, and 100% of your gift meets the specific need that you designate. Your friend or relative will receive a gift card, customized with your name, that describes how the gift you made in his or her honor is making a difference in someone’s life. It’s as easy as a few clicks on our website! At OrphansTear.org/giftcards you can help orphans, and at IWasHungry.org/giftcards you can choose from about twenty funds that help meet very pressing needs. We can mail the card directly to you or the recipient. Place your order securely online, or if you prefer, call us at 412-833-5826. Thanks for making a difference!